This risotto uses barley in place of rice adding great texture and nutty flavor. Basil pesto and bocconcini are stirred in at the end of cooking for a flavourful dish which mimics a caprese salad. Several of my recipes are the result of trying to come up with a variation of another dish that my children will actually eat. 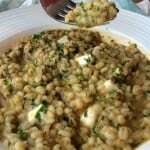 Pesto and Bocconcini Barley Risotto is one of them and, quite honestly, one of my most successful creations. I love your typical Risotto alla Milanese: rich, creamy and flavored with saffron. My mother also adds mushrooms to her risotto and this was the only type of we ate at home. When I discovered that my daughter did not like the flavor of saffron I decided to try modifying my usual recipe. On the day that I came up with this risotto I happened to have bocconcini on hand in the refrigerator. It occurred to me that one of my children’s favorite dishes is a simple caprese salad: garden-ripe tomatoes combined with fresh mozzarella and basil. Simply perfect! So why not add these flavors to risotto? I prepared this risotto for the first time using traditional arborio rice, and I held my breath. Success! Who would not love a pesto infused dish dotted with little bites of bocconcini that turn into gooey stringy cheese as they melt into the rice? If you don’t have bocconcini in your neck of the woods, a good substitute would be fresh mozzarella. After a while, I decided to change it up a little and I used barley instead of rice. I love the chewy texture as well as the nuttier flavor that pot barley adds to the dish. In case you were wondering what the difference between pot and pearl barley is, I did a little research that I’ll share with you. All barley goes through a pearling process whereby the inedible outer husk of the barley is removed. The pearling process is shorter for pot barley therefore it retains its bran layer. Pearl barley on the other hand completely loses its bran layer. As a result, pot barley has a darker color and pearl barley is white. Pot barley has more fiber in it since it retains more of it’s outer bran layer, therefore is more nutritious. It takes about 20 minutes longer to cook compared to pearl barley. This dish is prepared in the same way as traditional risotto. Hot stock is added one ladle full at a time as the barley absorbs the liquid. When the barley is tender, I stir in the pesto and lastly the bocconcini or mozzarella. I use my homemade pesto which I keep on hand in the freezer. However, a good quality purchased pesto will do. 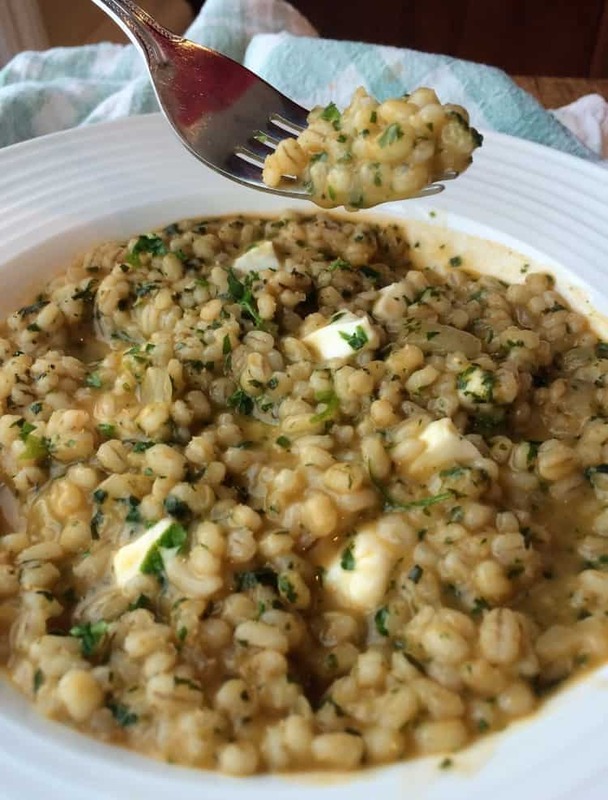 If you have little ones that aren’t crazy about traditional risotto, Pesto and Bocconcini Barley Risotto is the one to try! Let me know how they like it by tagging me with your photos with @mangiabedda or #mangiabedda on Instagram or Facebook. Buon appetito! This Pesto and Bocconcini Barley Risotto came about as a way to get my kids to enjoy risotto. Barley adds a wonderful texture and nutty flavor to this untraditional risotto. Place broth in a medium sauce pan and bring to a simmer. In a large dutch oven, heat oil on medium heat and sauté onion until translucent. Add barley and stir until it is coated with the oil and lightly toasted, about 2 minutes. Pour in the wine and cook until it has evaporated. Stir in tomato paste until well combined. Begin adding hot broth to the barley mixture with a ladle, one scoop at a time, and stir. When the broth has been absorbed, continue adding broth, one ladle full at a time. Continue cooking until the barley is tender but still has some bite to it, about 45 minutes. Remove from heat and stir in pesto and bocconcini or mozzarella. 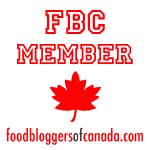 Be sure to stir in the bocconcini or mozzarella at the end of cooking, right before serving. It will immediately begin to melt. 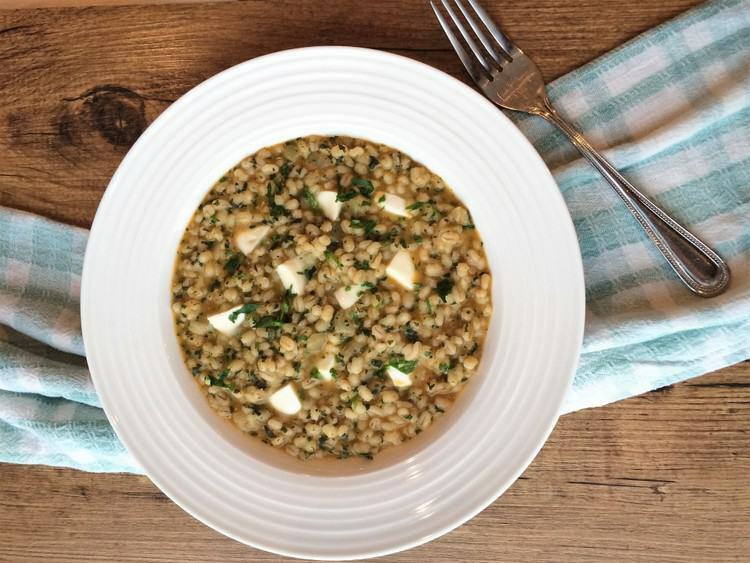 If using pearl barley instead of pot barley, it will take approximately 20 minutes less time to cook. You will also use less stock than indicated. Please note that the nutritional information provided is approximate and will vary according to the exact portion size. « Adventures of a Collective Kitchen, Vietnamese Style! Does this have to be stirred the entire 45 minutes that it's cooking? Thanks! Hi Luanne, like all risottos, it does require frequent stirring. You definitely can't stray away from the kitchen when making it! You can, however, use pearl barley instead of pot barley which will require about 20 minutes less to cook. I hope this helps and thanks for your question!